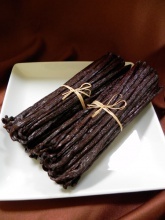 Our company has achieved milestone in offering a wide range of Vanilla Beans to our clients SPECIFICATION Moisture content is: 30 - 35%. Name: Good quality vanilla bean Item No. : PD-TW-170 Grade: AAA Features: No speckle, no mould, No heavy metal, no pesticide, Hand selected Color: Black Size: 10-20cm Admixture: 1% max Packing: Bulk or Tube or at your requests Moisture: 14% max Company Certificate: ISO22000, ISO9001, HACCP, CIQ, QS,KOSHER The vanilla is harvested, dried, then vacuum packed in bags of 5kg each. It is then packed into boxes that are 25kg each (5 X 5kg vacuum bags per box) Additional testing can be arranged at the customer's request. $ 20 / per kg.